Potts forgave bullies: "There's nothing to forgive. It's in the past"
NEW YORK (CNN) -- Before Susan Boyle came along and gave nearly everyone in the world goosebumps, there was Paul Potts. 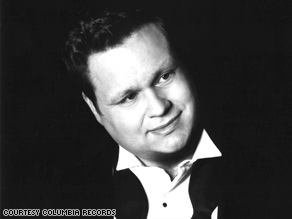 Paul Potts zoomed to fame thanks to his win on "Britain's Got Talent" two years ago. The winner of the TV program "Britain's Got Talent" in 2007, Potts recalls the butterflies he felt in the lead-up to his audition. "I'm not really sure what made me walk on the stage in the end," he says. "It did feel like I was walking under my own motion. Especially going out in front of Simon Cowell. I've always respected him for his honesty. I just didn't want to be on the receiving end of it." Like Boyle, Potts was initially scoffed at by the audience when he stood before the judges. With his crooked teeth and generous waistline, he seemed an unlikely fit for a talent show. But just like Boyle, he blew everybody's socks off when he opened his mouth to sing -- in his case, Puccini's "Nessun Dorma." Potts says he's noticed that Boyle's sudden fame has helped sweep new listeners his way. And the timing is perfect; yesterday he released his second album, "Passione," a collection of tracks sung in Italian, including a classical version of the song "A Whiter Shade of Pale." The album follows Potts' debut release, "One Chance," which sold more than 3 million copies and topped album charts in 15 countries. Potts might soon find himself on the big screen. He said Cowell is planning a film about his story. Potts said he even met with a screenwriter. However, he added, "I'll only believe it when it actually happens." Potts sat down with CNN to talk about excruciating dental work, apologetic bullies and the coin toss that changed his life. CNN: Is there going to be a duet, or album of duets with you and Susan Boyle? Paul Potts: I think we'll see what happens. ... I think we'll take each step as it comes. I wouldn't want to be another voice adding pressure on the remainder of Susan's journey. CNN: Much fuss has been made about Susan Boyle's appearance and whether or not she should have a makeover. How do you feel about that? Potts: I think she should be allowed to change anything she wants. I don't think she should be forced to change anything, but I don't think she should be forced to remain as she was either. Because at the end of the day you have to live with yourself for much longer than the attention that can be on you. CNN: Did you feel you were expected to make some changes? Potts: No, I think I was under similar sort of pressures as Susan's finding herself at the moment. I've had people say, "Well, why didn't you leave your teeth as they were?" Well, I think I'd have felt like a bit of a freak show if I'd have kept my teeth the way they were. ... Even though I was happy I couldn't show it as much as I wanted to because I was ashamed of my teeth. Also there were health reasons. My bottom teeth were being damaged by my upper teeth so something had to be done about it. I still remember the actual dental work being done. I actually had 17 injections to numb me out and I could still feel everything. CNN: Is it true that you based your decision on whether or not to audition for "Britain's Got Talent" by tossing a coin? Potts: Yeah, I decided if it landed on heads then I'd apply for the show, if it landed on tails then I'd cancel the application I'd prepared. I couldn't decide if I was good enough. ... I knew that I didn't look like somebody who'd stand a remote chance of getting through. And I wondered if I was too old. And so I flipped a coin for that decision. CNN: Have you kept that coin? Potts: Nope. I spent it on lunch. How many times I could've put 10 pence on eBay, I don't know. CNN: Do you ever wonder where it is right now? Because that 10 pence basically changed the course of your life, didn't it? Potts: It did. I think it started its next journey in a pastry shop two doors down from the shop I was managing. CNN: You've gone in a more classical direction with your new album, wouldn't you say? Potts: I think it's slightly more classical than the first one but I think it's still approachable. I think in the end, music is music. I'm not too precious about divisions in music. I think there's no issue with taking an iconic rock song like "Whiter Shade of Pale" ... and turning it into something a bit more classical. CNN: You were bullied in school, and music was a source of comfort. Since you've become really famous, have any of those bullies come out of the woodwork and tried to contact you? Potts: I've had contact with one or two. I had somebody send me a message through a Web site asking for forgiveness. And my reply to them was, "There's nothing to forgive. It's in the past." I think if you allow negative parts of your life to take over your future then it's like in "Star Wars," really. The dark side wins. So it's important to remain positive about the present and the future and just leave as much of the past behind as possible. CNN: Is there anything that you miss about being a cell phone salesman? Potts: Just the camaraderie of the people I worked with. I do keep in touch with them via text message, ironically enough.